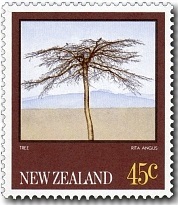 This issue of stamps featured the works of Rita Angus whose meticulous compositions in oil and water-colours earned her the reputation as a leader of the modern school of New Zealand painting. Henrietta Catherine Angus was born on 12 March 1908 in Hastings, the eldest of seven children of William McKenzie Angus and Ethel Violet Crabtree. In 1921, her family moved to Palmerston North and she attended Palmerston North Girls' High School (1922–26). In 1927 she began studying at the Canterbury College School of Art. She never completed her diploma in fine arts but continued to study until 1933, including classes at the Elam School of Fine Arts in Auckland. During her studies, she was introduced to renaissance and medieval art and received traditional training in life drawing, still life and landscape painting. After a short period teaching art in Napier, Angus lived mostly in Christchurch during the 1930s and 1940s. In the late 1940s, she suffered from mental illness and entered Sunnyside Mental Hospital in 1949. In 1950 she moved to Waikanae to convalesce and then settled in Wellington in 1955. From December 1969, Angus' health rapidly deteriorated and she later died in Wellington Hospital of ovarian cancer on 25 January 1970, aged 61. 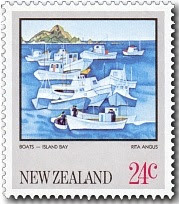 24c - Boats - Island Bay by Rita Angus. Painted 1962-63, an oil 610mm x 610mm - belongs to a private collection in Auckland. The Italian fishing boats at Island Bay, Wellington emphasised the complex pattern of shapes and colours created by the moored boats. 30c - Central Otago Landscape by Rita Angus. The "composite" landscape in Central Otago was made up of separate views recorded first in water-colours. These range from Lake Wakatipu and the Remarkables to Cromwell and Alexandra. It was begun in the 1950s and completed in 1969. 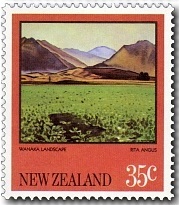 35c - Wanaka Landscape by Rita Angus. 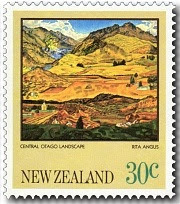 Vivid colours and clearly defined forms were hallmarks of Rita Angus' style and these feature in her Wanaka landscape. 45c - Tree by Rita Angus. Rita Angus made numerous watercolour studies of flowers and plants and in 1943 painted a tree which grew in her sister's garden in Greymouth. Mint First Day Cover for this issue. 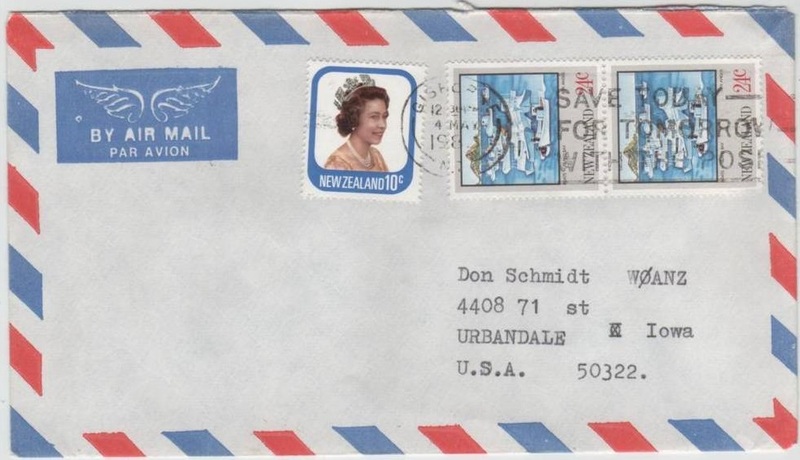 Dated 4th May 1983 - This is not a first-day cover.